When you first signed up for your Affiliate account, you ended up at your control panel waiting to be approved. From this point on you must sign in to your account to view your products and commissions. 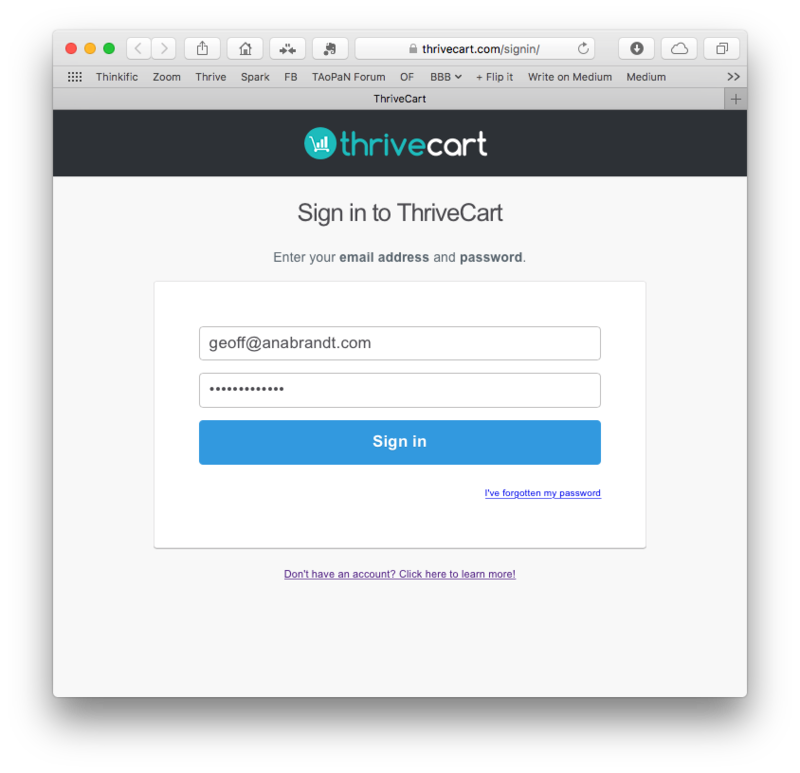 Go to Thrivecart.com and click the Signin link on the upper right. Remember, Thrivecart is the software that TAoPaN/Belly Baby Beyond uses to administer its affiliate commissions program. You’ll be deposited at your Affiliate Dashboard. The screen consists of two main tabs. The My Profile tab allows you to update your contact information. The Dashboard tab (which you see above) contains most of your stats. The middle of the screen shows a breakdown of your sales and commissions for ALL of your products. At the bottom, you have another two tabs. The My Commission History tab shows the payouts you’ve received from Belly Baby Beyond over time. 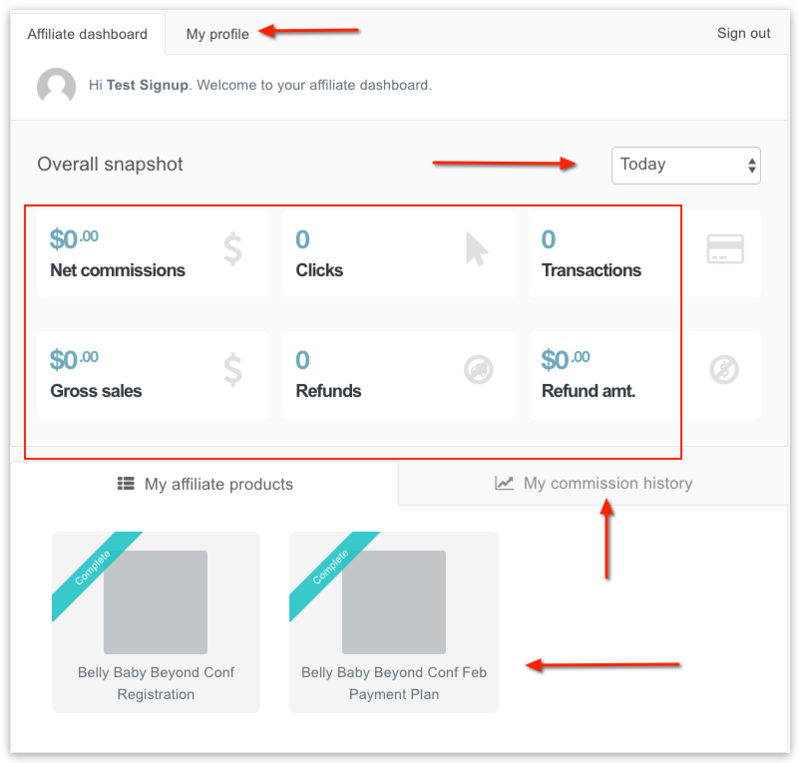 The My Affiliate Products tab shows you all your available products. Note that initially there are two Belly Baby Beyond products. Both are used to allow people to purchase tickets to the Belly Baby Beyond conference. They are just two ways to pay. One product is for paying all at once. And the other allows the person to pay using a payment plan. Click on a product to see its dashboard. This screen is very similar to the account dashboard. Except all the stats shown pertain to that product only. At the top, you can click the red button to connect your dashboard to your PayPal account. 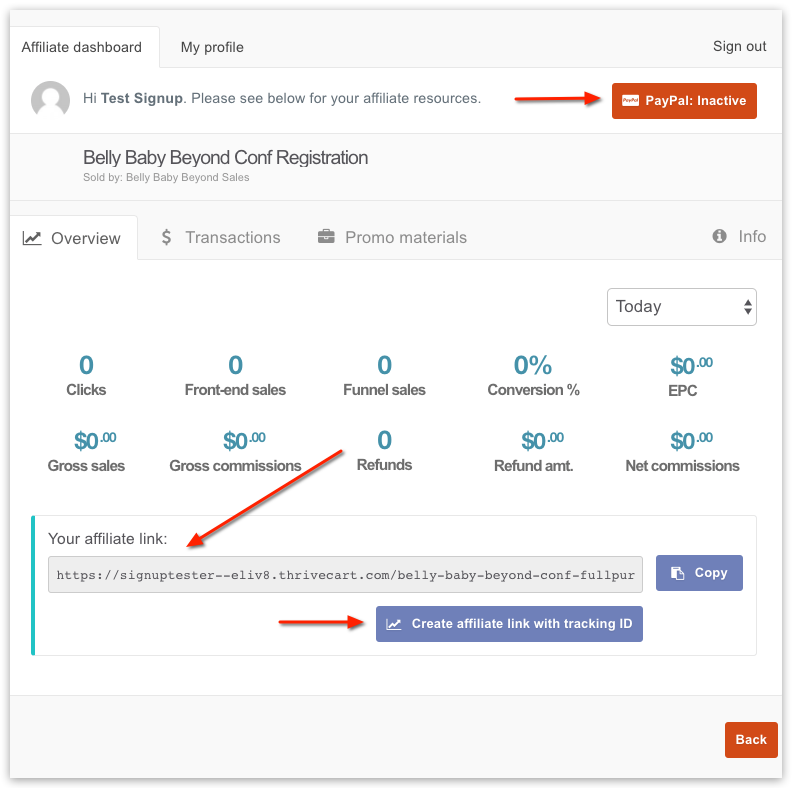 By doing so, Belly Baby Beyond will automatically deposit commissions into your PayPal account without any action on your part. Otherwise, commissions will have to be delivered manually by some other means (check etc.). At the bottom you see your affiliate link for this product. Note at the very beginning of the link is your personal ID. This is what channels the commissions to you. Below the link is a button to create a link with a tracking ID. This creates unlimited variations of your link in case you want to track the performance of your link in different places. Finally, you have two more tabs. The Transactions tab lists all the times your link was used to purchase the product (i.e. bought a conference registration ticket). The promo materials tab is where you’ll find all the support files that make the job of selling easier. This may include sales materials, product logos, images, code etc. All available for download. How do I Sell Conference Registrations? As mentioned above, when looking at a specific product’s dashboard, you can see that product’s unique link. Whenever you want to make sure you get credit ($100) for a Registration ticket sale, make sure that person clicks on your link to purchase the ticket. Click the purple Copy button and the link is transferred to your clipboard ready to be pasted anywhere. You can place your link anywhere – on your web site, in an email sent to your mailing list, in your email signature etc. Note that you have a choice. You can place the link for the one time payment or for the payment plan. Often you’ll place both inks on your web site or email and give your clients a choice of how they want to purchase. One last note – if you want to measure the relative performance between placing your links on different web pages or different email blasts, you can generate a tracking ID (in essence an additional unique ID in top your already unique link) for each “place” you want to put your link. Just click the purple button. Type in a unique code in the box and click the green “Get my code” button. The system generates a new link with your tracking ID tacked on the end of it, ready to copy and paste just like your regular link. 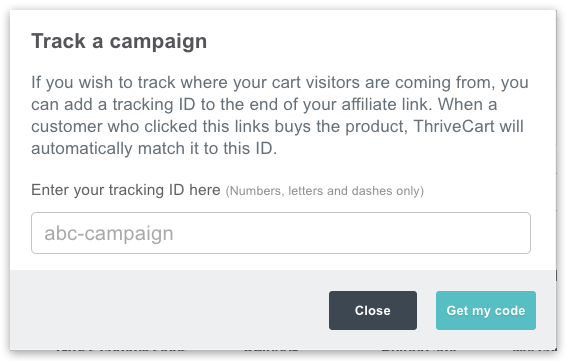 Your dashboard will track the sales stats for each of your different links (with the different tracking ID’s) so you know where your best (and worst!) performing links are. If you have any further questions, don’t hesitate to drop a note to our customer service department (support@bellybabybeyond.net) and they will be happy to help. In the meantime, best of luck earning commissions!